The China (The Boxer Rebellion) 1900, Mexican (Vera Cruz) 1914, Haiti 1915 Campaign, Dominican Campaign 1916, World War I 1917-1918, Haiti 1919 - 1920, Nicaraguan Campaign 1927 - 1933, World War II 1941 - 1945, North Korea 1950 - 1953, Vietnam 1964 - 1973, Somalia 1993 and The War On Terror (2002 - Present). The collection shows the placemarks of the birthplaces of each winner and the descriptions show date of birth, rank, organization, location of deed, and the citation. Photos are also available. The collection was developed by 'Up_The_Spurs' from the Google Earth Community who also did the recipients of the Victoria Cross. Last week Google released their really great photo tool Picasa for Linux. They did this by making refinements to the open source Windows API software called WINE. A recent story in the WINE newsletter about the port mentions that Google is doing the same thing for Google Earth. Google Open Source Program Manager Chris DiBona has revealed that Google Earth will be the next application ported according to a LinuxToday story. 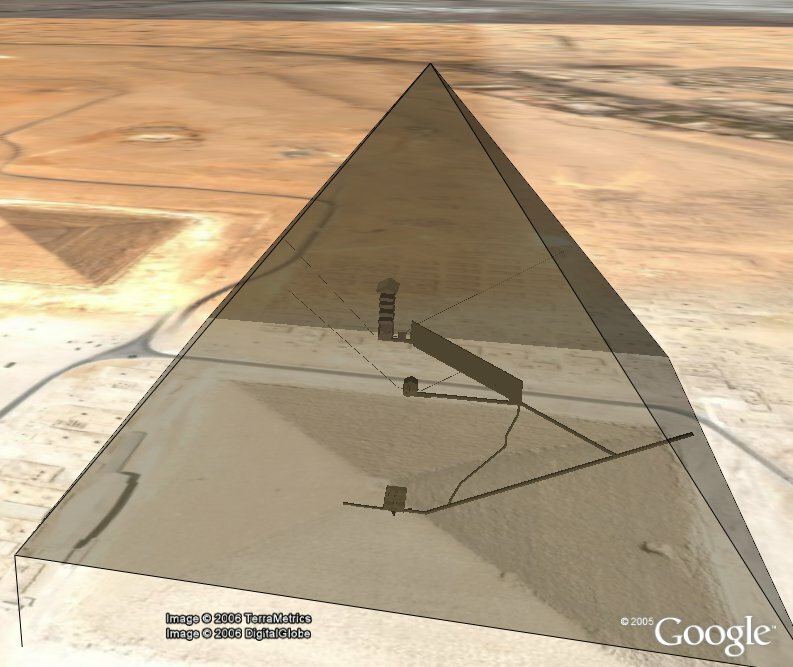 The Great Pyramid of Giza, one of the seven wonders of the world, can be seen in the satellite photos of Google Earth. But, it is just a 2D photo on a hill of terrain, not the actual structure. Yesterday, someone called 'atf' at the Google Earth Community posted an excellent 3D model of the Great Pyramid which also shows the interior chambers by making the walls of the pyramid transparent. Once you load the model, you need to turn off the "Terrain Layer" to see the full model. He has provided a number of camera views - look at the "Views" folder and then double click on the various views. This lets you get a close look at the entrance, Queen's chamber, the King's chamber, etc. Two weeks ago I posted an article about the tomb of King Tut which also used similar 3D techniques. I expect many other interesting archaelogical sites will be created for visualization like this. The Google Geo Developer Day being held one day prior to the Where 2.0 conference filled up after only a few days. However, Google has had so many requests, they've decided to open up a waiting list to Where 2.0 registrants who want to come, and if they get a bigger venue, they'll let those on the waiting list first attend. In addition to the details at the waiting list registration form, you should know that I will be making a presentation at Geo Developer Day of unique Google Earth collections of placemarks, network links, and applications. Mike Pegg of GoogleMapsMania will be presenting Google Maps mashups as well. Hope to see you there! 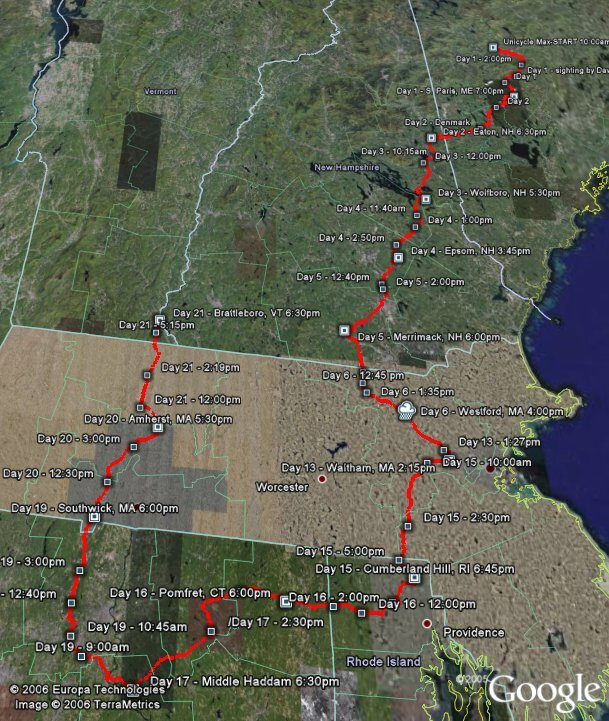 This is a rather unique idea for raising money for college: Ride a unicycle through 6 states in the northeast and collect money by amusing people along the way and through a clever web site. So, that's what Max DeMilner is doing. 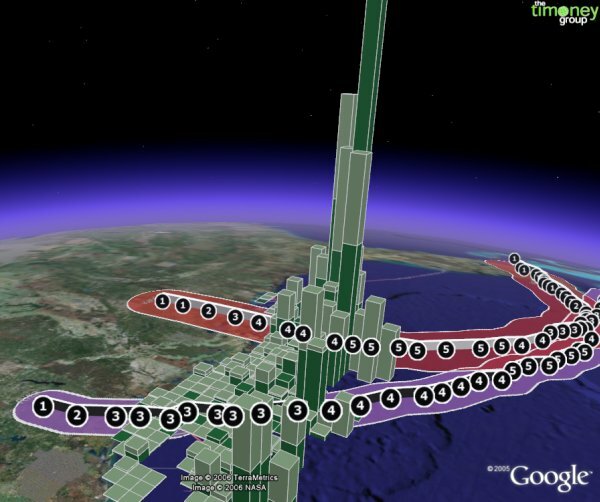 And what better way to visualize and track Unicycle Max than through a Google Earth network link ? Max has a GPS and his brother periodically receives the GPS track and uploads it to the server so you can see his track. I was contacted by Max's brother Kyle who is managing the web site. Kyle asked for some help with setting up the Google Earth file and I simply recommended the use of the network link. This is a really unique and fun idea. You can turn on the roads layer in Google Earth and zoom in and look at the aerial photography to see the places he went. I recommend you visit the nicely designed web site, look at some of the fun pictures and videos, read about how he got stuck for a week due to raining and flooding, and check out where he is today (or just see the route he took). And, how about dropping Max $5 or more for his entertainment and college education? This is another example of using Google Earth to visualize a controversial building project. The Cape Wind Project is a proposal to build the first offshore wind farm in the United States in the vicinity of Nantucket Island and Martha's Vineyard in Massachusetts. 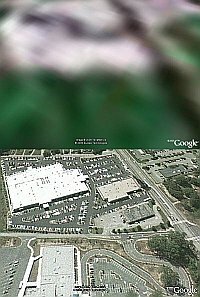 Someone named 'RockyRaccoon' at the Google Earth Community posted information about this last year and included a map overlay showing the area. Apparently the primary concern is that the wind farm will scar the views from these locations. 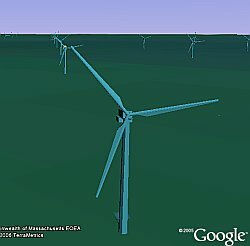 Recently, someone named 'redgreenblue' posted a Google Earth file with 3D models of the wind turbines in the proposed locations. Now you can put yourself on the shore and see what the view would look like in GE's realistic views using satellite photos and 3D terrain. I suggest you turn off the map overlay before testing the views. 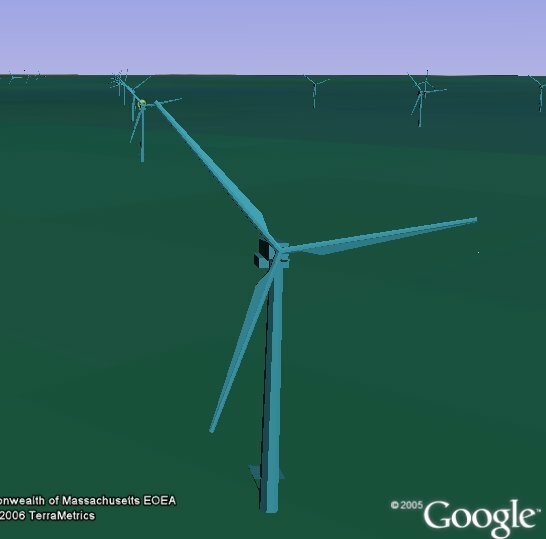 The GE file includes views from the wind farm, and views from the shore. Just double click on the different camera view placemarks. Because the wind turbines are located several miles off shore, the curvature of the Earth causes some of the turbines to be below the horizon. The camera views don't get you close enough to the ground. I suggest you try to get lower to get a more realist view. 'redgreenblue' has included some retouched photos to simulate the views as well. You will notice some of the views show no sign of the turbines. Earlier this year I wrote about a building proposal in New York. And, a wind farm proposal in the UK. Google Earth is definitely an excellent way to visualize proposed building projects. 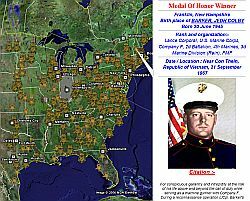 The Ohio State Highway Patrol has just released a well done, and dramatic, collection of placemarks showing the locations and details of fatal traffic accidents in the state during 2005. The number of fatal crashes is stunning. Download the Ohio fatal traffic accidents collection now. They have used icons to represent whether the fatality was in a car, motorcycle, alcohol related, or commercial. 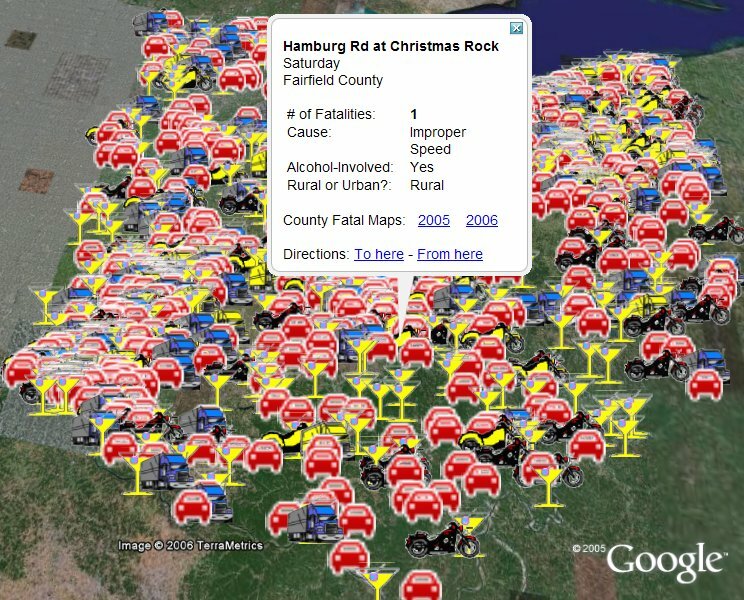 Each placemark contains details on number of fatalities, location, type, alcohol involved, and the cause. You can zoom in and see the actual location in the satellite/aerial photos in GE, and turn on the roads layer to see better where each happened. "It is imperative that motorists are educated about traffic safety and understand the dangers on Ohio's roadways," Colonel Paul McClellan, Patrol superintendent said. "Providing accurate and detailed information utilizing Google Earth will help to inform troopers as well as the public about these problem areas." It seems quite a few people just drive off the road in rural areas and alcohol is not even involved. The other strong point clearly illustrated is that drinking and driving really is dangerous. 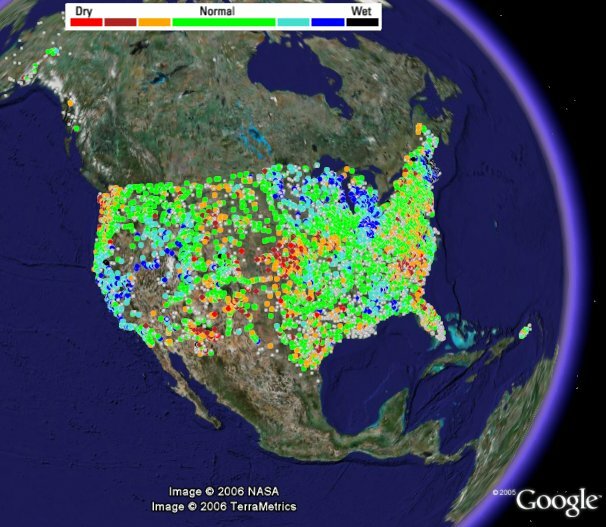 Google Earth Blog rarely comments on other mapping products since it is focused on GE. However, the release last night of Microsoft's Windows Live Local new imagery for the UK is worth mentioning. 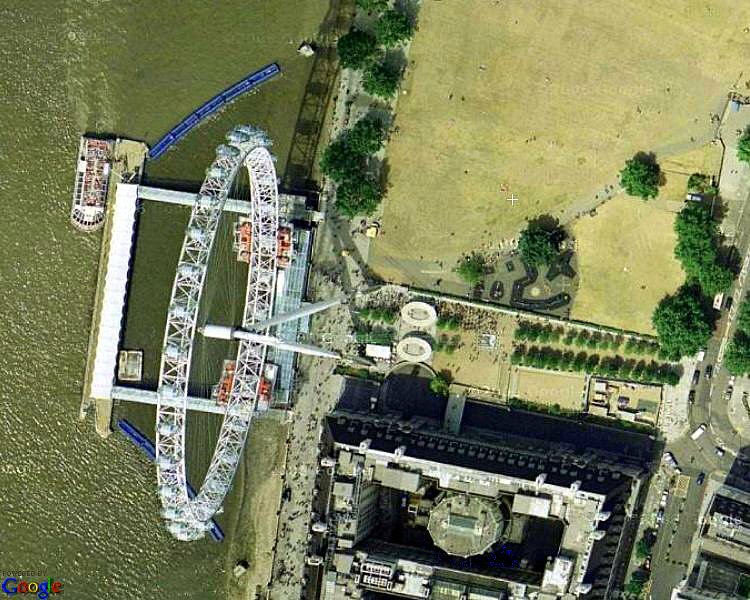 The new Live Local imagery is really much superior to the satellite/aerial photos in the Google Earth/Maps database for the UK (Google above, Microsoft below in screenshot of the London Eye here). Live Local's imagery has been processed for clarity, color balance, and sharpness. 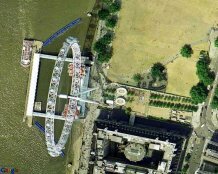 The resolution is equal to Google's best imagery for the area, and it is much better in several areas in the UK where Google's isn't even high resolution. For a real comparison, I recommend trying FlashEarth which lets you zoom with the mousewheel and simply click between Live Local and Google Maps satellite views. Google's data looks like a patched quilt of imagery from on high, while Microsofts looks much more consistent. Not long ago Microsoft announced it had invested serious money to compete with Google, and they have made some significant acquisitions of companies in the aerial photography and virtual earth industry. Hopefully Google has been taking notes. Because Google is going to need to release some serious upgrades soon to Google Maps and Google Earth or they will lose the leadership advantage they have had for the last year. Also see OgleEarth's comments on this subject. 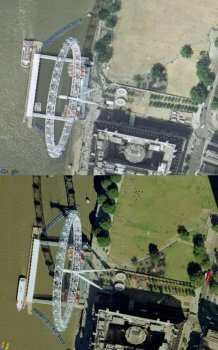 I decided to try using Google's Picassa on the Google Maps version of the London Eye used in the comparison above. I did a "feeling lucky", color saturation, and a sharpness. The quality of the new image is much improved. This is the kind of thing I'm sure Microsoft has done with their data in order to get the better look. You can see the result in the photo here (click on the thumbnail for a better view). If you have not yet registered for the Where 2.0 conference, you can get a 10% discount by being a Google Earth Blog reader. The O'Reilly Where 2.0 conference brings together the people, projects, and issues leading the charge into the location-based technology frontier. Location-aware technologies combined with mapping and other data are poised to create a whole new class of web apps and services. Where 2.0 will explore what's viable now, and what's lurking just below the radar. Meet the people behind the mash-ups and the platforms, and the people looking ahead to the future of geospatial. Where 2.0 will be held June 13-14, 2006 at the Fairmont Hotel San Jose, California. 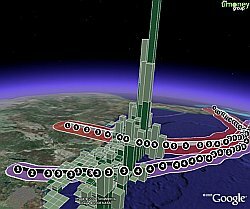 Google Earth Blog readers get 10% off registration using code whr06gglerth. For more information visit http://conferences.oreilly.com/where. Just last week I was remarking that it was surprising more online lodging services were not using Google Earth. 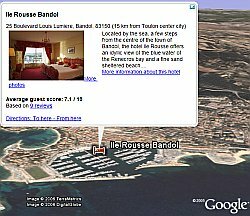 Well, one of the more established online lodging services for Europe, booking.com, has implemented its own Google Earth implementation. They have a hotel finder network link which lets you zoom over an area (you need to be below 100 km), and it will then load hotels for that area. One thing I was impressed by is they have implemented the GE and web interfaces in several languages (just click on the flag for the language you prefer). Each hotel placemark can contain photos, description, and links to more information including reservation capability. Once you find the hotel you think you like, make sure you zoom in in Google Earth to look at the scenery in the satellite photos. 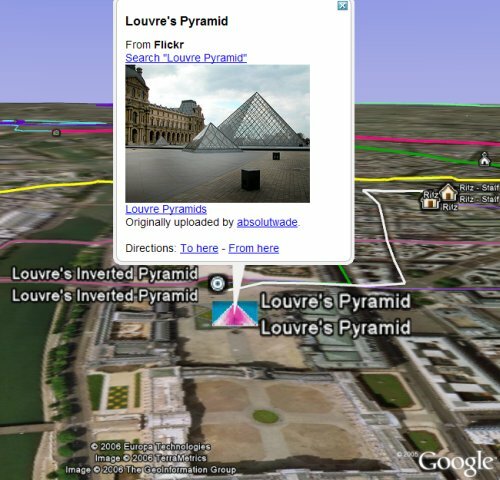 Also, turn on the Google Earth Community layers to see what interesting things are nearby. 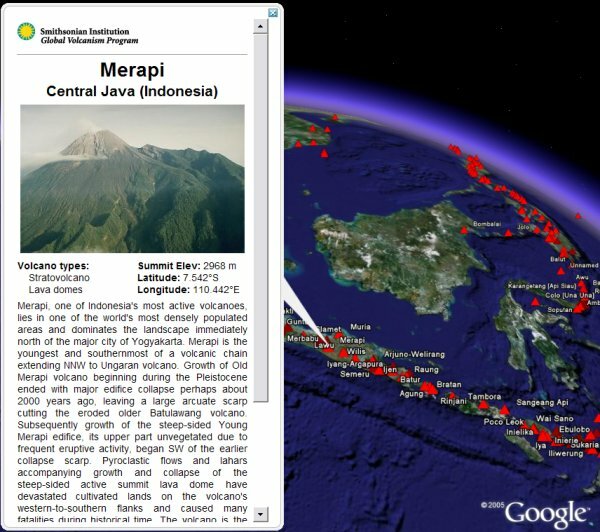 There was a lot of interest in volcanic eruptions this week after the elevated alert status of Mount Merapi in Java, Indonesia. 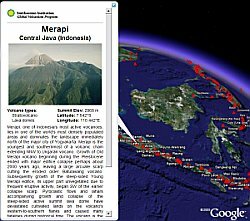 I just discovered that the Smithsonian Institution has an excellent educational web site about volcanoes which is home to the Global Volcanism Program. It turns out their data serves as a source for the Volcano World data provided in last week's article. 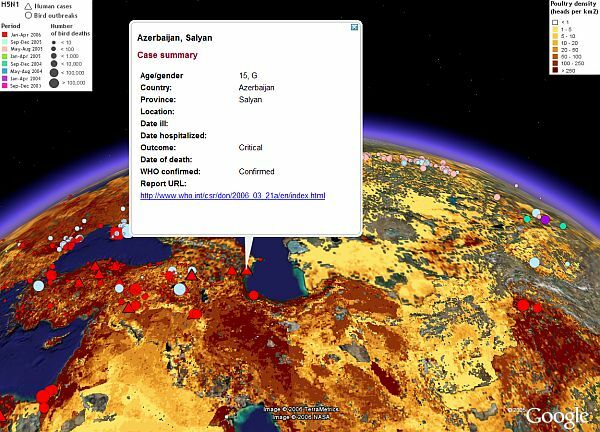 On the new Smithsonian site is a new Google Earth file which shows the locations of all Holocene-era volcanoes (last 10,000 years) . More importantly, the placemarks contain a great deal of useful information and many have excellent photos of the corresponding volcano. This collection is vastly superior to the "Volcano Layer" provided with Google Earth. I highly recommend you check this one out. 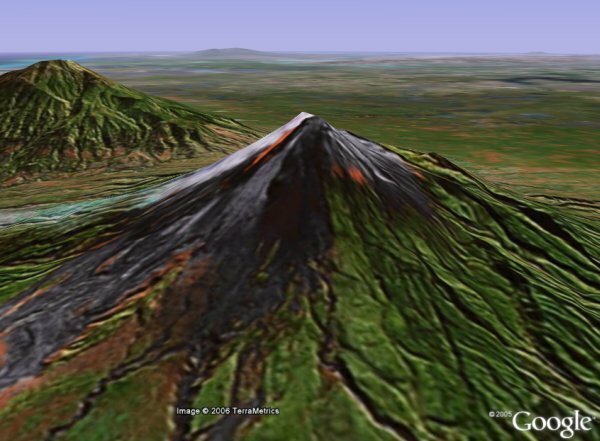 Make sure you use the pan/tilt features of Google Earth to view the 3D views of the volcanoes while you are looking at the satellite photos. One thing you may notice is that some of the placemarks do not appear over the tops of volcano peaks. The Smithsonian site explains this in detail, but the primary reason is that they put the placemark at the center of a field of volcanoes/vents in many cases rather than mark each vent. This quite attractive building is the headquarters of British Secret Intelligent Services MI6 located in Vauxhall Cross, in western London, England. It makes an interesting 3D model project for SketchUp. 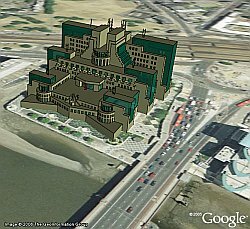 Or, so thought Google Earth Community (GEC) member 'barnabu' who posted this 3D model of the MI6 headquarters earlier this week. The building was designed by architect Terry Farrell in 1987. The building has appeared in James Bond movies including "Golden Eye", "The World is Not Enough", and "Die Another Day". Perhaps you can figure out the scenes from the movies by looking at the satellite photos and this 3D model in Google Earth. You can read more detail about this building and see some photos at the Wikipedia. 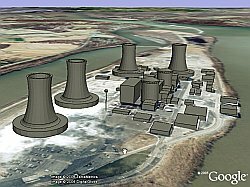 Here we have a nice 3D model of an infamous location: Three Mile Island near Harrisburg, Pennsylvania, USA. This was the site in 1979 of a partial core meltdown which did not result in any identifiable injuries or the need for evacuation. See details at Wikipedia. The Three Mile Island model was created by Joe Wade and posted at the Google Earth Community. When you first open the model, he has one of the cores exposed in a cut-away view so you can see he has modeled the core interior. You can click on "Core_half" to return the missing half. 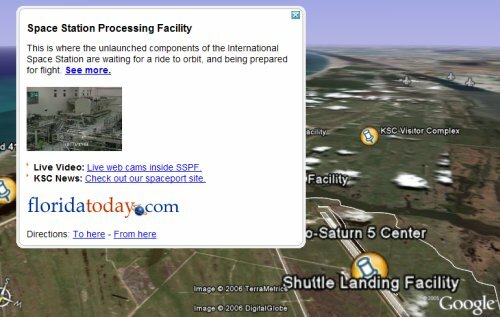 If you turn off the 3D models you can also see the plant in the satellite photo provided by Google Earth. Nice work Joe! 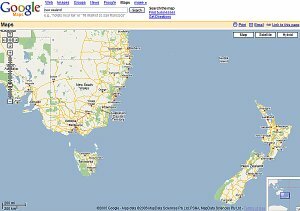 GoogleMapsMania reports that Google Maps got a data update last night which gives Australia and New Zealand detailed road maps. Further inspection shows that the road layer has not fully migrated to the Satellite - Hybrid view. More importantly, a quick check does NOT show detailed roads yet for Google Earth. In the past, Google has released new road data layers in Google Earth first, then Google Maps. I guess they wanted to give maps a chance this time. Hopefully, the road data will migrate to the GE database soon. Since there hasn't been a formal announcement from Google, they probably haven't finished deployment of the new road data layers. Another one of those mystery views from a satellite photo in Google Earth. 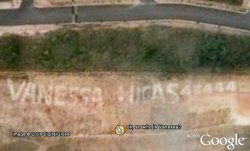 Someone at the Google Earth Community noticed a womans name and "phone number" written in 12-meter tall letters on the ground near Belo Horizonte, Brazil. You can view the location here. So, the poster asked why someone would do this? Somone speculated maybe a real estate developer (based on the nearby development). Then, about 2 months later someone called 'jfjunior' posted he had done some Google searching and discovered "Vanessa 45444" was an MPP candidate, or in Portuguese a "Candidato a Deputada Estadual". Apparently the photo is from 2002, because 45444 was the number she used during that election. It amazes me how the Internet enables you to find out about almost anything odd you may see if enough people look into it. There's now almost 500,000 registered members at the GEC forums. And for every registered user there is usually 15-20 people not registered viewing the forums. GE Sleuthing - Burning Ship? It is amazing to me that the travel industry has not embraced using Google Earth to a larger extent. So far, for GE we have seen one big global hotel listing (Earthbooker), one air fare locator, and a bed and breakfast guide. If you are going to Norway, there is an excellent resource called Reiselivsbasen with links to more than 4000 lodgings in Norway. Unfortunately, Norway has limited high resolution satellite photos, but even so it is still beautiful to look at in GE. This travel tool not only supports Google Earth, but also allows you to get location information and download it for use in your GPS so you'll be ready when you arrive. 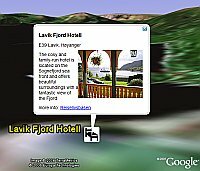 Reiselivsbasen is definitely worth reviewing if your planning a trip to Norway, or if you are looking for ways to use Google Earth and GPS for your travel site. Here's a sample of hotel listings with pictures in the placemarks. Each hotel listing can have photos, acommodation information, directions, mapped location, a Google Earth link, contact information, payment options, and more. You can also create your own map of places for use with a GPS (go here for instructions), it supports export to TomTom, GPX, and KMZ. 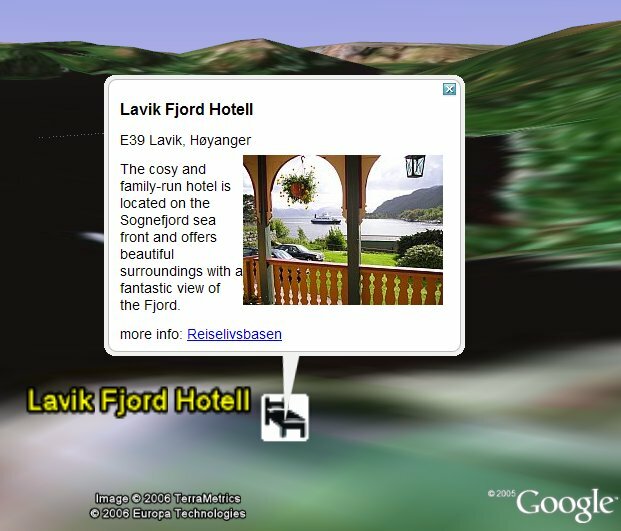 Also provided is a Google Earth network link called GE LiveLookup which lets you look at places in Norway and it will automatically find the 30 nearest accomodations (including camping, hotels, bed and breakfastes, etc.). Thanks to the author Arnulf for contacting me. Great work! Last month I wrote about a Google Earth campus map created for Bowdoin College. 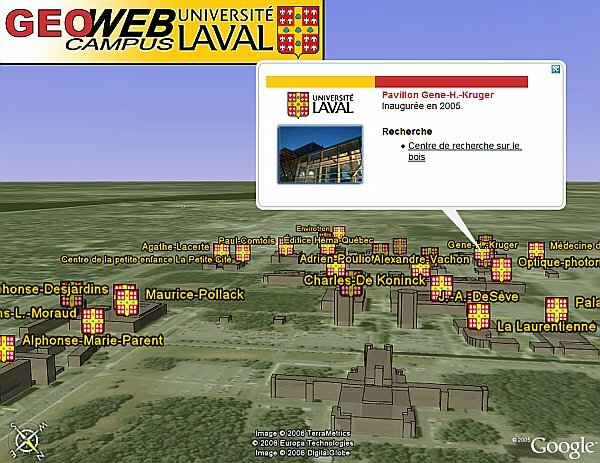 Now, a company in Quebec, Canada has created a 3D map of Laval University campus. In this case, the main campus buildings have simple 3D models overlayed on top of the satellite photos in GE to help enhance the feel of the campus. 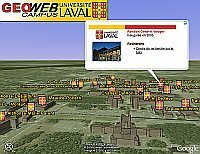 Placemarks provide photos and links to more information (in French). GeoWebServices appears to be an enterprising new geographic information services company which is currently occupying a non-profit .org domain name. SketchUp has announced Mac OSX SketchUp Pro 5 users can now download an OSX Google Earth plugin so they can also post and download to and from the Google 3D Warehouse. Mac users should read the above announcement first as there are some important instructions required for a successful installation. The free Google SketchUp for Mac OSX is still not out yet. SketchUp3D.org - a new blog dedicated to sharing ideas, news, tutorials, and examples for using SketchUp effectively. via OgleEarth. SketchUp video tutorials - this page lets you view (or download) a number of video tutorials showing how to create models with SketchUp. I highly recommend these. My favorite is "Model from a photo" which just amazed me. If you haven't downloaded the free Google SketchUp, I highly recommend it. This is an amazing tool for creating 3D models. Google SketchUp is a free application whose primary purpose is for outputting models for use in Google Earth and is for personal use only. SketchUp 5 Pro is the commercial version (US$ 495) which can be used for commercial purposes and allows exporting your models to many formats and printing (you can download a free 8-hour trial). Last week I was told about an article at GoogleMapsMania about a mashup for international test Cricket venues which also had Google Earth support. After noticing a problem with the download, I contacted the author of the Cricketing Yak and explained how to set up the Google Earth file on his server by setting the mime-types. You can easily download the Cricket venues for the UK and Australia now (he plans to add more areas later for GE). 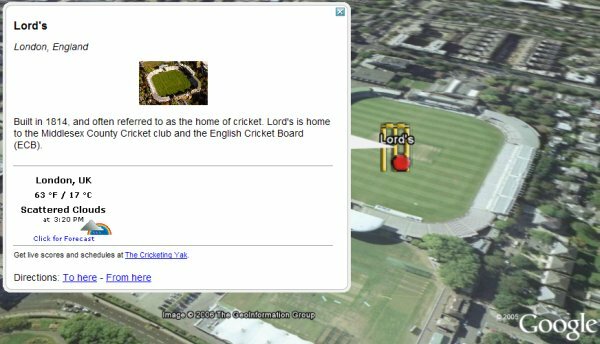 Each placemark shows the actual field/stadium in GE's satellite photos where cricket is played, and the descriptions provide photos, local weather, and a link to scores. Other countries are displayed in the Google Maps version. The tomb of Tutankhamon - also known as KV62 in the archeological world - was the most intact tomb of a pharoh of Egypt ever found. It became very famous for the wealth of treasure it contained. 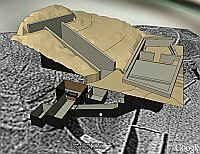 Someone at the Google Earth Community called 'atf', who is from Zaragoza, Spain, posted an excellent 3D model and an aerial photograph of the area to help you visualize Tutankhamon's tomb. Since Google Earth does not currently allow you to place models below the surface of land, how do you show the location of a tomb? 'atf' used a method similar to one I wrote about last month. He took his subsurface model and 'floated' it above its actual location. 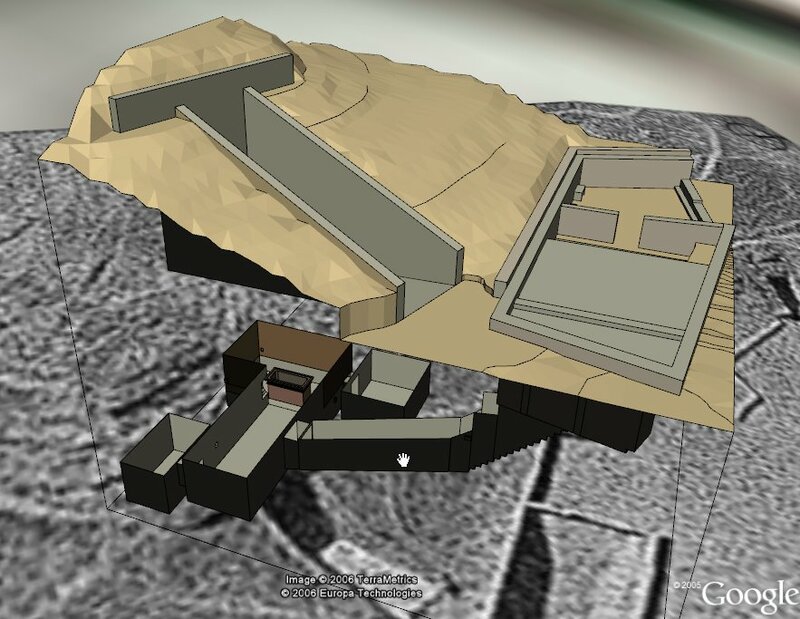 Look at the model of Tutankhamon's tomb , and you can see the stairs leading down to the burial chamber. A few important things to note: make sure you have the "Terrain" layer turned on and that your Preferences have "Elevation exagerration" set to 1.0; raise your altitude a bit and then double-click on "Tumba de Tutankhamon" to get a good view; If you open the folder you can see 'atf' has provided several views of the various chambers and corridor. Excellent work 'atf'! See Wikipedia entry on KV62 - Tutankhamon's Tomb. The guys from Eyebeam Research have been doing more cool things with OpenGLExtractor (OGLE). OGLE lets you extract 3D models from any OpenGL application. 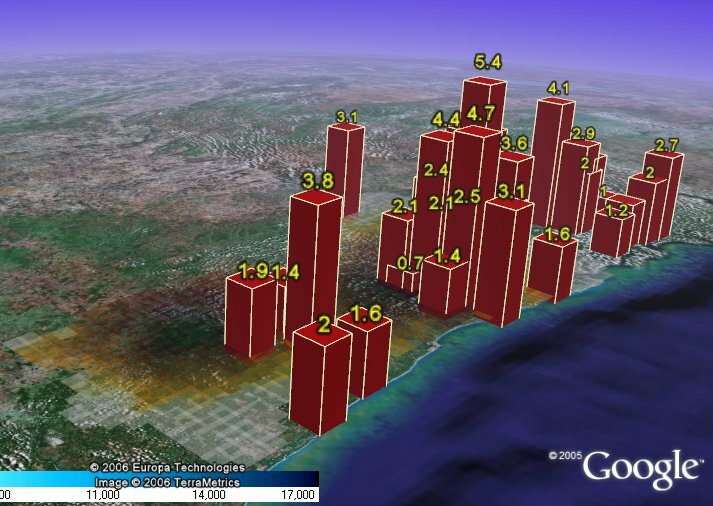 and you can convert the models and put them in Google Earth (see earlier writeup). They have printed off some of the 3D buildings from Google Earth on a Dimensions 3D printer. Here you see some 3D buildings in New York City, and the resulting "print". The Eyebeam guys say in their blog they had to do a bit of manipulation to add floors to the bottoms of the models before they would print. Of course, OgleEarth mentioned this today. The 3D print made it in Make as well. 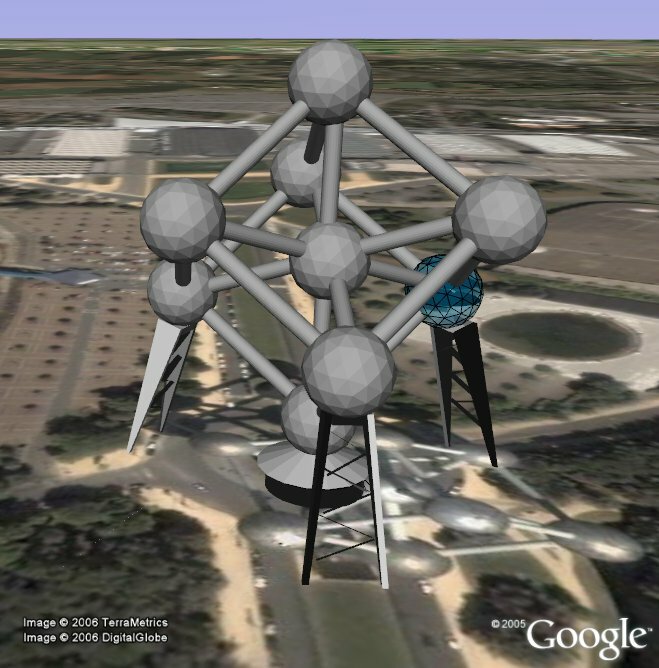 Read this to learn how to see 3D buildings on top of the satellite photos in Google Earth. 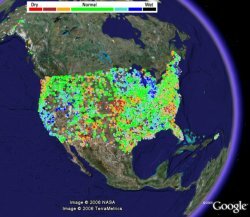 There are a couple of upcoming conferences, and a significant Google event, coming up if you are a developer of software or mashups for mapping or vitrtual earth applications and can get to the west coast of the US. All of these events will have Google Earth team members participating and sponsoring. The first conference is Where 2.0 by O'Reilly (well known publishers of technology books) which is being held in San Jose, California June 13-14. Where 2.0 brings together the people, projects, and issues leading the charge into the location based technological frontier. John Hanke, co-founder of Keyhole, and who now heads up the Google Earth team, will be speaking. Also, there's an important event being held the day before Where 2.0 conference on June 12 called "Google Geo Developer Day". A limited number of Where 2.0 attendees are being invited to the Googleplex (Google headquarters) to meet the Google Geo development team. They promise to make 1 or 2 product announcements. By the way, if you go you'll have a chance to meet me - I'll be there and at the Where 2.0 conference as well. July 24-28, a conference called GeoWeb 2006 has been organized by Galdos Systems - authors of GML (Geography Markup Language). 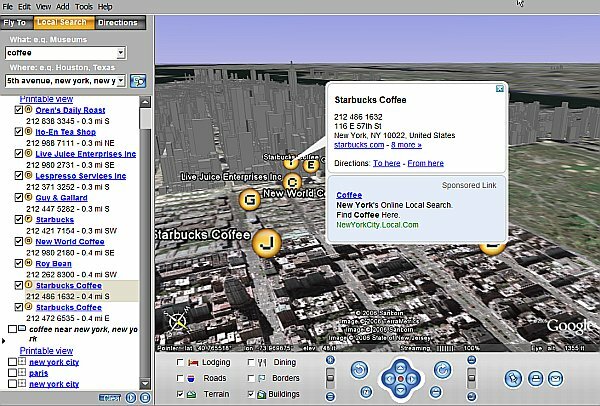 GeoWeb 2006 is the meeting point of consumer location services and professional geographic information technologies. Prominent sponsors are Microsoft, Google, Oracle, and Autodesk, and many others. Keynote speakers will include Michael Jones (CTO for Google Earth), and Stephen Lawler the General Manager of Microsoft's Virtual Earth Business Unit. Michael Ashbridge, KML Data Engineer at Google Earth, will be presenting a 3 hour workshop on KML and Google Earth interaction. 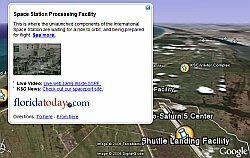 Florida Today has included an interactive Google Map on their site which maps space launch sites at Kennedy Space Center and Cape Canaveral. It includes a database of every launch since the dawn of the space age, shuttle and rocket launch video and images, and video tours inside facilities people usually don't get a chance to see guided by its space reporters. 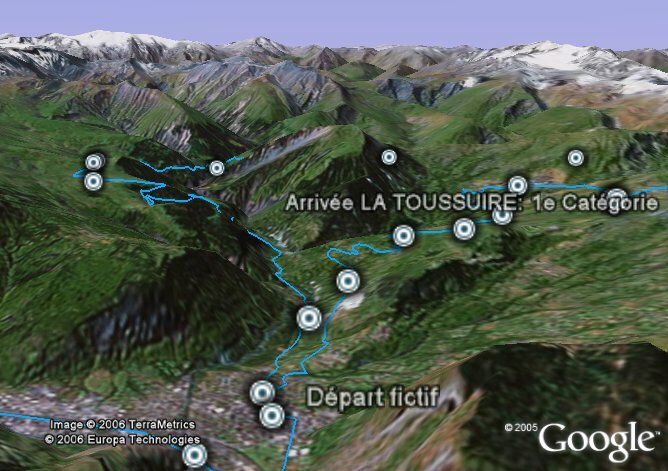 It also has an enhanced 3D Google Earth version you can download as well. This is a great example of a newspaper using its historical archive to create a maps mashup for visitors from all around the world. 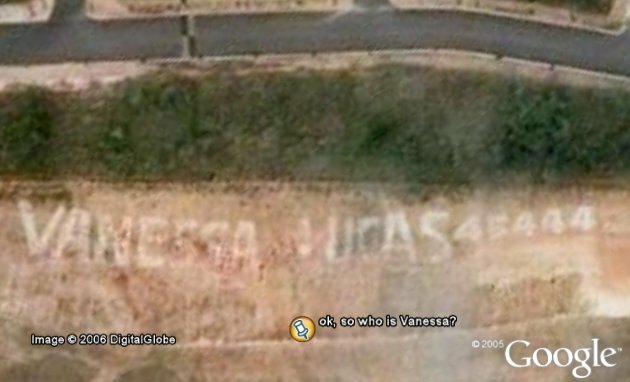 Thanks to Mike at Google Maps Mania, for bringing it to my attention. Now we just need some enterprising Google SketchUp modelers to create some 3D models of the Vehicle Assembly Building, launch pad, and a space shuttle or two for the pad and runway. 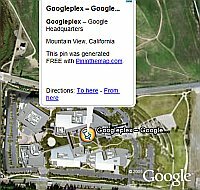 I would really like to see the following features implemented for Google Earth. Last week, one of the blogs I regularly check on - Digitally Distributed Environments (DDE) - posted about an amazing feature in a really excellent new 3D panorama tool called DevalVR. DevalVR is available as a plug-in for your browser and is much better than QuicktimeVR in my opinion (download DevalVR plugin here). What is really neat is that you can stream movies into a 3D location within a panorama view in your browser! To test the video capability, Andy at DDE created a huge screen between these two towers and inserted a video he had created. First download the DevalVR plugin, then download the panorama with 3D streaming video. After you pan around to view the screen, you simply click with your mouse on the video controls and you can watch a movie on a 3D projected screen (and listen) while panning around. Like Andy, this amazing tool just made me smile. I had seen 3D video years ago on a Silicon Graphics workstation when I worked at NASA. But, now here it was in a plug-in within my browser! This is the kind of 3D content smarts I would like to see added to Google Earth. Not only texture map 3D models, but allow video plug-ins and VR panorama plug-ins on 3D surfaces! Recently Vlogmap.org (which I wrote about last August) released a new network link showing georeferenced videos which they call "geovlogs ". You can also still download their network link showing the georeferenced locations of video blogs . Imagine if they could instead put placemarks where their videos were made and you could view the movies on 3D "mouse-in" (instead of drive-in) movie screens? 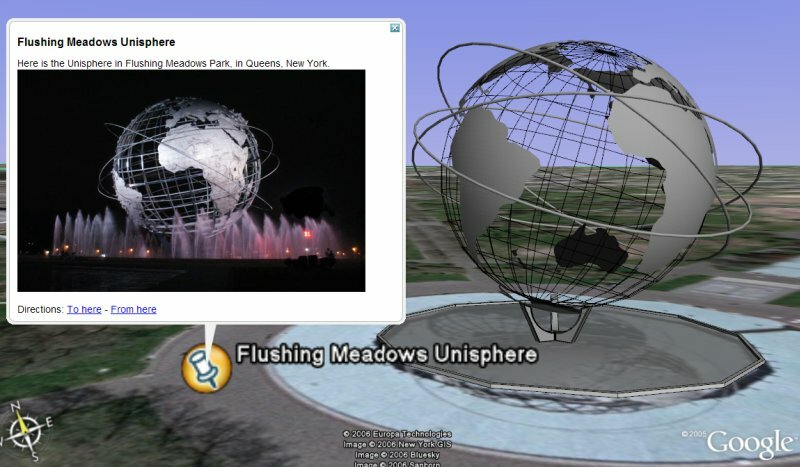 And, imagine if you could view the panoramas of World Wide Panoramas from within the 3D content of Google Earth itself? There's a fierce multihull sailboat race going on right now called the MultiCup 60 (the boats are 60 feet long). 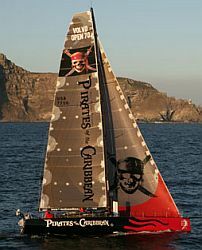 They are racing from London around Portugal, Spain and into the Mediterranean Sea until they arrive near Nice, France. They are already about 1.5 days into the race. Here is the official web site (also available in French), and here is the map they provide for showing the current positions. 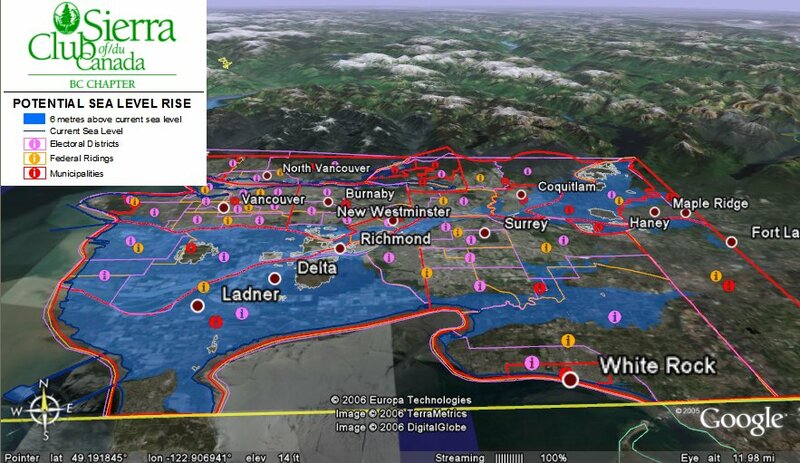 Of course, I prefer the Google Earth file they have provided for showing the boat positions . That way you can zoom in and see the positions from any angle and view the more realistic satellite photos in Google Earth. Plus, you can add things like current global clouds to see what the weather is like. The placemarks provide more detail on each boat (in French) and a picture of the boat. I have created a network link which will update their data once per hour automatically (assuming they have new data). 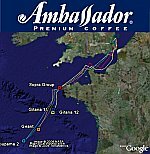 Speaking of ads, this race is heavily sponsored by Ambassador Coffee, and you get a big one in the GE file. Thanks to Didier for contacting me about this. 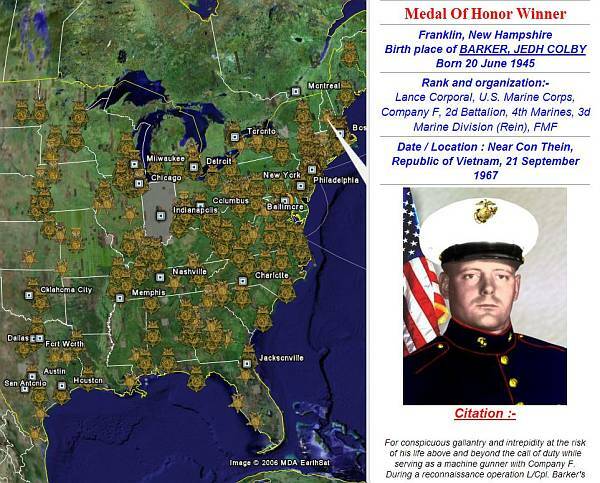 There has been some talk recently in the blogsphere about Google Earth's ads. Some blogs seemed to be a bit confused about how to see them, and others had their facts wrong. So, I decided to write something about them. First of all, the ads in Google Earth are very unobtrusive. 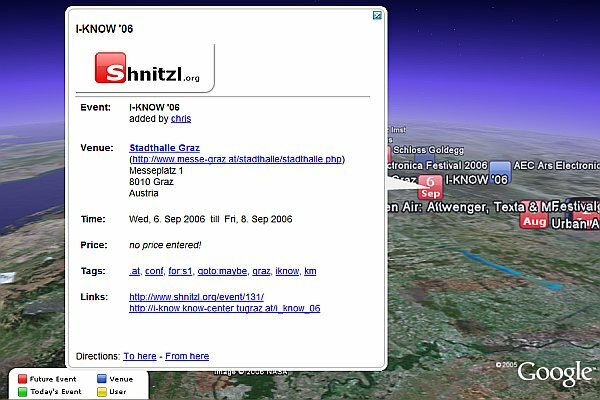 In fact, they have been in Google Earth since the beginning of 2006. And, as I previously reported, if you have the PLUS version of GE you can turn the ads off. You only see the ads if you perform a localized search for a product or service. Even then, they are only seen in a subtle fashion. Ads only appear for cities where Google has business address information tied to its maps. So, for any country which has a localized version of Google Maps, you will likely find ads. So far, there are localized versions for the US, UK, France, Germany, Italy, and Spain. First, to see the ads you need to use the "Search" pane to "Fly To" a location. Entering a city like say "New York City" works. Next, select the "Local Search" tab above the search field. Now enter "What" you want to search for. Search for "Coffee" for example. You will get a list of coffee locations for New York City. Click on the various choices and for some of them you will likely see a light blue box below the normal placemark description with an ad in it. You will see the words "Sponsored Link". The ads don't always appear. If you click on the same placemark you will sometimes see an ad, sometimes not. If you provide an address, you will get even more localized searches. In my example I added "5th Avenue" to the "Where" field and got Coffee shops only near 5th Avenue. You can pretty much search for "Coffee" and see ads for any of the countries listed above. Try "Paris" for example. You don't have to use the "Local Search", you can also enter "Coffee" in the "Fly To" window after you've flown to a location. 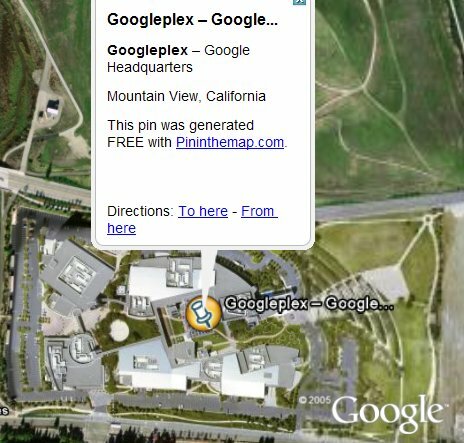 I believe Google is still being tentative with their ads for business/product/services in Google Earth. I'm glad that they don't in any way interfere with the user experience of browsing Google Earth and the very useful content people are producing. But, the ads are there if you look for them. In one of my 3D model roundups I listed a nice 3D model by 'jpwade' which added details for the Glen Canyon Dam in Arizona. Since the canyon is fairly accurately represented by the digital elevation model built into Google Earth, the 3D model makes it look very realistic - with one exception. The satellite photo of the area shows the bridge which crosses the canyon before the dam. 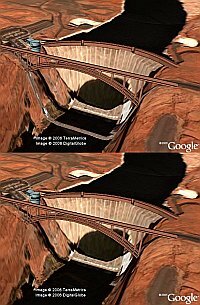 But, since Google Earth just overlays its satellite photos over the terrain the photo of the bridge appears to drop down into the canyon. Someone at the Google Earth Community named 'gscad2004' suggested the photo should be retouched to erase the bridge. A short while later, 'GregTSL' posted a retouched photo overlay which in fact erases the weird bridge anomaly. After downloading the 3D model above, download Greg's overlay here. Every day, Google Earth becomes more real with the addition of user input. Amazing! It was just announced today that Google Earth won two major Awards in the 10th Annual Webby Awards in the categories of Best Visual Design/Function, and Broadband. Google Earth also won both categories as the People's Voice Award (voted most popular) . The Webby Awards are like the "Oscars" for Internet web sites and applications. It seems a bit weird for Google Earth to get a "Webby" award, but there's no denying its one of the best applications on the planet. Google Maps also won a well-deserved Webby Award in the category of Services, and People's Voice Awards for Best Practices and for the Services category. Apparently most people really like these apps. See the full list of awards, nominees, and winners. World's (second) Biggest Soccer Ball? The 2006 FIFA World Cup Football semi-finals are being held in Dortmund, Germany (the sixth largest city in Germany). The city planners are hoping the football games being held here will draw attention to Dortmund. 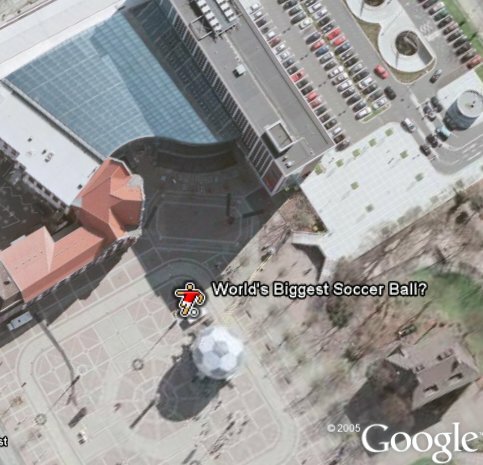 They have erected a huge 15 meter (50 feet) diameter soccer ball in a plaza near the center of the city. I found out about this through a recent post at jaunted.com. See it in Google Maps as well. In late March, Google upgraded to high resolution satellite and aerial photos for all of Germany. The photos in Dortmund are particularly good. You can easily see the elongated shadows of people standing near the soccer ball in the winter sun. I would estimate the resolution is about 4 inches per pixel for this area. Closer inspection of the soccer ball in GE shows steps leading into the structure. I suspect this is actually some sort of museum. Anyone know more about it? Un muy buen modelo 3D acaba de ser publicado hoy por 'Gerardo64' de la CGE en el Foro Modelos. 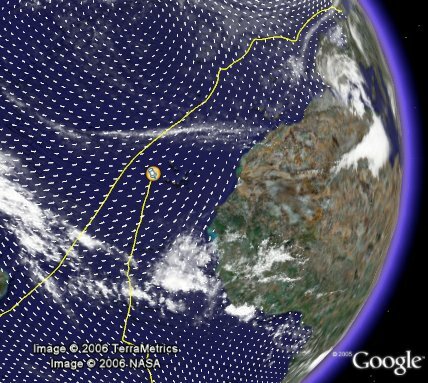 Asegúrense de inclinar la imagen en Google Earth para verla mejor, luego de descargar el modelo 3D de la Unisfera . Luego de haber visto el modelo 3D, desactívenlo desde Mis Lugares para poder ver la hermosa imagen satelital de la Unisfera que es realmente bonita (para no verla tan distorsionada véanla bien desde arriba). La Unisfera es una representación de la Tierra hecha en acero inoxidable. Está localizada en el Corona Park de Flushing Meadows, en el barrio de Queens, Nueva York. La Unisfera fué realizada para celebrar el comienzo de la Era Espacial, y fué considerada el Símbolo para la Feria Mundial de Nueva York en los años 1964/1965. El tema de esta Feria fué la "Paz a través del Entendimiento" y la esfera representaba la interdependencia global. Fué dedicada a los "progresos humanos en un mundo que se achica dentro de un Universo que se expande". La foto mostrada viene de 'DanTheGoogler' de la CGE quien publicó una marca de posición de la Unisfera y es una foto personal suya tomada en Agosto de 2005. Fuente - Wikipedia. Gerardo64 está enchufado con sus buenos modelos 3D de los que hablé en otro momento . 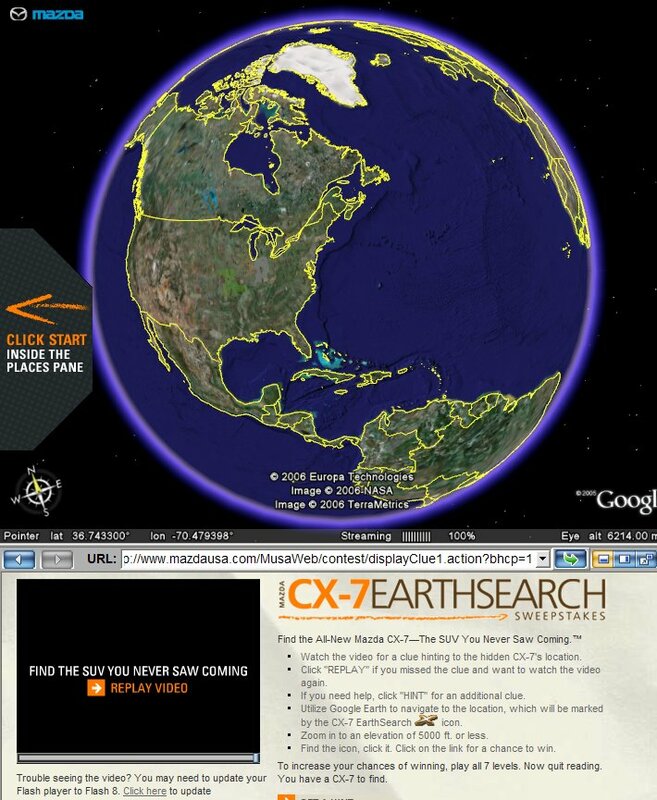 There is a forum at the Google Earth Community called History Illustrated. Occasionally, a particularly well-done collection of placemarks with detailed information is posted, which really helps illustrate historical events. In late March, an excellent collection of placemarks and overlays providing details on the lives of the Six Wives of King Henry VIII was posted by 'LuciaM'. Henry VIII's notorious treatment of his wives is well known, but few people probably know the full background on their lives. 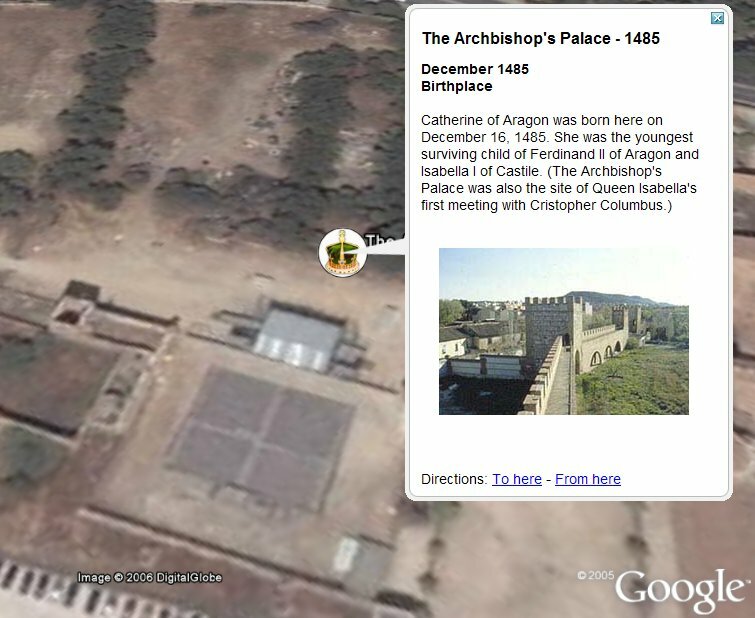 LuciaM provides a chronilogical history to each wife showing the locations of birth and other events in their lives in Google Earth and providing overlays to pictures of castles where high resolution aerial photos are not yet in GE. In addition, photos of paintings and pictures of wax likenesses are shown. Links are provided for further information. LuciaM's original post contains all the photos within the GE file. I have created a version where the pictures are downloaded as needed - which is a faster load. Download Six Wives - Original version (2.8 Mbytes), or Faster version (78 K). By the way, it's best if you open the folders for each wife in the "Places" pane after you load the model and read each placemark in chronological sequence. The Six Wives is a very fascinating read and greatly enhanced by showing the locations in Google Earth. The last example of historical documentary I saw done this well was the story of Sir Ernest Shackleton's adventure in the Antarctic. Great work LuciaM for an excellent collection! Make sure to read her post and let her know how you like it. 'PhilVerney' one of the regulars of the GEC - Google Earth Community (and a moderator) posted a collection of placemarks showing the ten most expensive homes on the US market in 2005 according to Forbes Magazine. Each placemark shows you the location of the houses in Google Earth, and many of them are in high enough resolution to see details in the satellite/aerial photos. The placemarks also contain some details about the houses, their prices, and a photo. The houses were priced at the time between US$46 Million and US $75 Million. I'm guessing this house would be worth even more if it were ever on the market. I understand they often have lots of bunnies in the back yard. 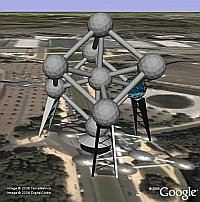 Atomium - This is a model of an actual building built for the 1958 Brussels World's Fair which is a 'unit cell' of an iron crystal magnified 165 billion times. You can clearly see the building in the satellite photo in GE, although it looks weird projected flat on the surface. Posted by 'Gerardo64' at the GEC. Solar Sail - This model is of a real space ship designed to fly on the Solar Wind (gases in space escaping from the sun). You can read more about it here. The model created by 'Gerardo64' at the GEC, read his post for more details. Space Station - This model posted by 'hwtnv' at the GEC is the space station from "2001: A Space Odyssey". He converted it from a 3D model archive located here. International Space Station - This model was posted by 'jpwade' at the GEC. It is not accurate to true colors of the station, but I like the idea of making space more colorful. On a related note, 'Gerardo64' posted a nice little tutorial on how to create curved surfaces with Google SketchUp (his example is the bow of a boat). If you want to make your own 3D models, check out the new free Google SketchUp. Also, don't forget to check out Google's new 3D Warehouse network link. A recent article in the Scottsdale Times talks about the influence Google Earth, Google Maps, and other mapping tools showing aerial and satellite photography has boosted the business of aerial photographers. After you ignore the bit of sensational speculation at the beginning of the article (speculations about using aerial photography for spying), there are some very interesting points. The aerial photography business has traditionally only been accessible to firms who could afford the high cost of aerial photography which involves flying planes, processing expensive photographic and positional data, and managing huge databases. Ian Erickson of AnalyGIS says: "What Google Earth has done is put that technology up for free, to the world." What does this mean to the aerial photography business? You might think all this free overhead photography would negatively impact the aerial photography business. But, according to Rob Decker of AirPhoto USA in north Phoenix "Generally, imagery that you can find for free is usually much older than the images you would find in a professional application". Google Earth photos are usually 2-4 years old (some are older, and a few are less than 2 years old). If you need to see something which has changed more recently, then you will probably need to consult an aerial photography company or a satellite photography company like Digital Globe (the primary satellite photography provider for Google Earth). These companies are continuously updating their databases and may have newer data already on hand for what you need. The cost of aerial images are priced according to currency and resolution. So, the more recent the photo, the higher the cost. But, if you are a realtor with a large number of listings you may not want to drive out to check out all the properties in your database. Having access to recent photos showing the property can be worth the cost. Some of the aerial firms are selling their data to Google, Yahoo, Microsoft, etc. who are all offering aerial photography to enhance their mapping tools. And, now that so many people have been made aware of the value of aerial photography it seems these new free tools are actually helping grow the aerial photography industry. One of the members of the GEC - Google Earth Community named Sgrillo (his id is 'rsgrillo' at GEC), has posted two freeware applications (Windows) he has been developing for Google Earth. Sgrillo is from Ilheus, Bahia, Brazil. The first application is called GE-Path and as you might guess allows you to draw paths and save them as KML files for sharing with other GE - Google Earth users. But, this application also lets you draw polygons, calculate areas, measure distances, and he has added a number of export options such as Excel, and comma delimited text files. The paths (or polygons) are created by placing placemarks in GE and then importing the resulting KML into GE-Path. The second application, GE-Graph similarly allows you to put data in placemarks and it will create bar graphs. You can set graph values, colors, scales, and labels. It also supports importing and exporting options. To download these two applications go the the web site which has more details and screenshots. You can see an example KML of GE-Graph here. Great work Sgrillo! The Aviva Challenge is an attempt by a 33-year-old woman from the UK to become the first woman to sail solo, non-stop around the world against the prevailing winds and currents. Dee Caffari has actually nearly competed her journey which began 20-November-2005. She is just passing the Cape Verde Islands on her way back home north to the UK. Very soon she should cross her outgoing path from last December. You can read her diary entries on the Aviva Challenge web site. You can also see her current position and the path she has taken so far in Google Earth. Check out the global clouds and wind data for her current weather situation. After several months alone at sea, I can only imagine how difficult it must be passing so close to the Cape Verde islands. It must be tempting to stop and say "Hi". 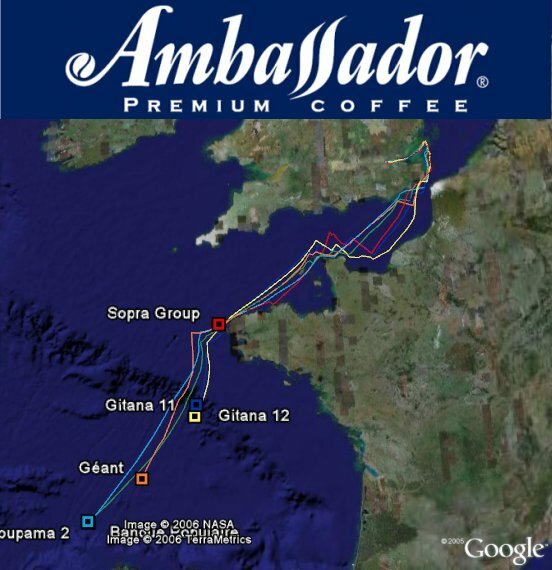 The company sponsoring this trip is called Aviva and is an international savings, investments and insurance group who has sponsored other sailing adventures. Best of luck to Dee and fair winds for a fast journey home. Speaking about the need for geography lessons reminded me now would be a good time to highlight a good web site for helping educators use Google Earth and other technologies to teach geography. Juicy Geography is a web site which does just that. Recently the author of Juicy Geography has released a lesson on practical activities for using GPS units in the geography curriculum. As part of his lessons, he points out how mapping tools like Google Earth and Google Maps can be used to enhance geography education. 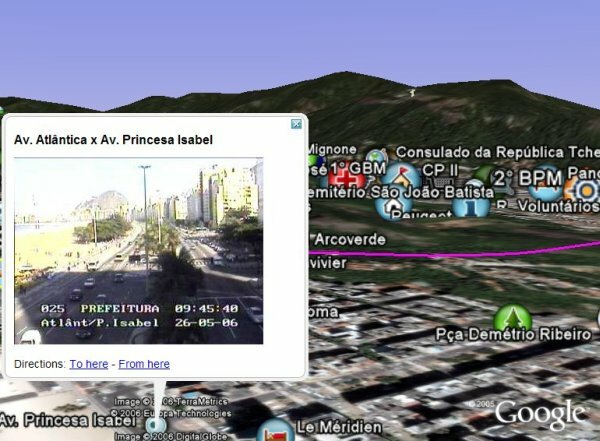 In this lesson he points to tools for displaying GPS information in Google Earth/Maps and vice versa. Juicy Geography is published in the UK, but I noticed he has a map showing where recent visitors to the site come from. It was encouraging to see a large percentage of visitors are coming from the US. As a big proponent of Google Earth, I certainly believe all people should become more geographically aware. So, I whoeheartedly support raising awareness to learn more about geography. One of National Geographics' objectives is to try to raise awareness of the importance of geography, and they have produced a heavily sponsored web site called "My Wonderful World" to increase global learning. So, it is only natural they concentrate on publishing the negative aspects of the survey results. As an American myself, I was at first really concerned about these results. So, I had to look a little deeper at the survey. If you read the full report (PDF) you will find some good news: 1) the majority of young adults use the Internet; 2) those who use the Internet for news score better than those who don't (and would have scored much better if they could have used Google Earth to answer questions); 3) half of the respondents said map reading skills are "absolutely necessary" in today's world; 4) Of the 20 questions in the survey, over 50% of the questions were answered correctly - or almost correct (in my opinion some of the questions were easy to miss by young American adults given how the US news media reports) - by the majority of the respondents. Some other things to note: the maps provided in the survey did not include labels, were black and white, and resolution was not very detailed. New York is a weird state geographically and I bet respondents would have done better if told to point the approximate location of NYC. Also, many of the respondents did worse on questions about places furthest away from their daily lives such as Asia (that seems normal to me). Helicopter Rescue Training - You can see a guy hanging below this helicopter in the shadow. This one posted at the GEC by 'KnowZee1' last October. Google Maps view. More details at GoogleSightseeing. Location of Concordes - Fans of the world's fastest commercial airliner (now grounded) have posted the location of all 20 aircraft. 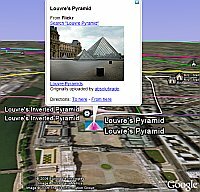 See them in this Google Earth collection of placemarks. Antonov AN-225 - World's Largest Aircraft discovered by 'Clorius' at GEC on 19-Apr-2006, a few hours after the new data was released to GE. See details on this plane. Newspaper Parking Lot - An innovative newpspaper in Amsterdam decided to decorate their parking lot to look like a newspaper when viewed from above. See translations of the headlines (funny) at GoogleSightseeing. Mazda has just started a contest in which you can win (US Citizens only) a Mazda CX-7 SUV by playing a simple game in Google Earth. They call it the Mazda CX-7 EarthSearch Sweepstakes. This is a little better than the Fiat contest back during the winter Olympics. In the Mazda contest you are given clues, you then have to zoom in close to look at the satellite photos of the target region at an altitude of 5000 feet or less. Then you should be able to find the hidden location. After the first clue you are prompted to give your name and address before you can go further with the contest. Also, they only give one more location at this point and will give more locations after May 9th. This is to keep you hooked to playing the game. Whether they got the idea from Fiat or not, it's yet another example of a company using Google Earth's popularity as an advertising tool. There's a popular web site called "Where's Tim?" 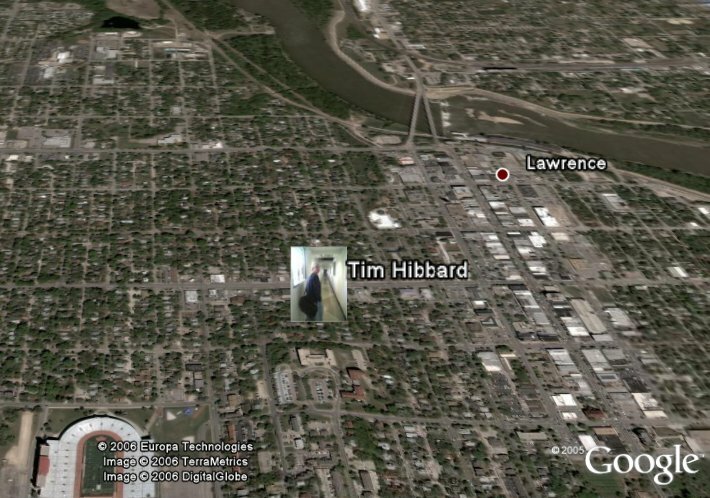 which follows the places a guy named Tim Hibbard is going: live in Google Earth or Google Maps. Tim is using a phone with GPS. As he moves he leaves a trail of where he's been, or you can load a history for a given day. Some people wouldn't like this kind of scrutiny. But, Tim works for a company called EnGraph which sells GPS tracking software. So, it is good marketing for his employer. Tim also has had a simple "Fly To with Google Earth" which shows a placemark of his current location on the satellite photos in GE. I sent him some E-mails and suggested he try using a GE network link to follow him interactively, and I suggested he allow history paths to be shown in Google Earth as well. He has already implemented both. Here is the Where's Tim GE network link (he comments here) which updates once every 15 seconds. If you click on the Placemark you get his location and current speed (if he is moving). If you are on the Where's Tim main page, you will see a place to enter a date to "Get History" on the lower left. After you enter a date and hit "Go" you get an option below the date to "View History in Google Earth". This will load his track for a given date. Here's today's path for example. By the way, Tim is kind of easy to find because he lives and works in Lawrence, Kansas - the default location Google Earth starts with. via GoogleMapsMania which also links to another person being tracked with Google Maps.